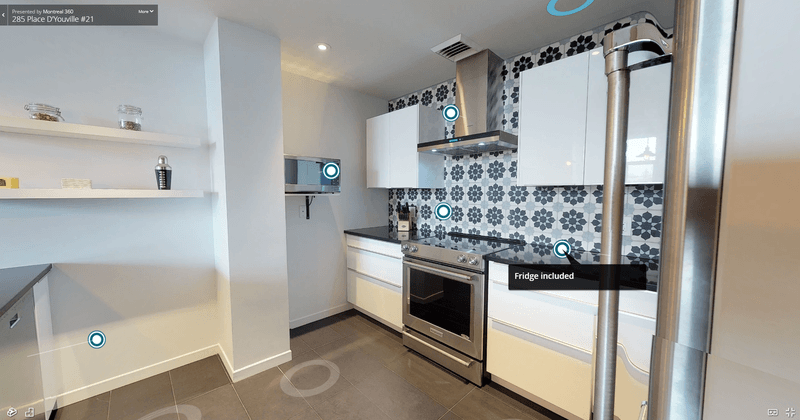 Why are Matterport 3D virtual tours beneficial to real estate agents, buyers, and sellers? It is no secret that the photography industry has been evolving at a much faster pace than the real estate agent’s ability to change the way they market their listings. In fact, real estate agents have not been using technology at its full extent, and that’s a problem for many brokers. Changing these old habits, however, requires the agent to understand where to begin learning, and when to start using this new found information. It is common to see people getting lost in all the information presented to them — and not only with real estate agents. If someone wants to learn how to use the power of technology in order to increase their productivity, sales, time management, etc, it’s most likely that they will need guidance to achieve it. This is why our recommendation is to start by adopting something simple that positively affects all concerned parties. Focus on things that will help you as a real estate agent; your buyer, and your seller lead. Within this article, I will explain in the first section why 3D virtual tours are something to consider as a realtor. In the second section, I will explain how a Matterport virtual tour positively affects the buyer, the seller, and the agent. Section 1: Matterport 3D Virtual Tours: Why Are They Important? Before we start developing on the subject, It is important for everyone reading to know what a Matterport Virtual Tour is. Below, you can see an example of a real estate 3D virtual tour. Not so long ago, regular pictures were the only way to showcase your listings online. Then came videos, slideshows, 360 pictures, 3D renderings, and here we are today talking about 3D virtual tours, VR, and virtual mapping. I don’t think that I need to sell you on the Idea of VR. At this point, pretty much everyone that is somewhat interested in technology knows that it’s coming. However, the technology is still too young to discuss its effects on real estate. This is why in the following study, we won’t talk about all the benefits of using a Matterport VR tour for your client, but rather a study on the changing behaviour of online users regarding the tools that they have at their disposal. Companies use Street View to show the interior of their business, and the study we’ve made of over 500 businesses in 2018 is pretty straightforward on how consumers now react to service-based companies. We started the study by hand picking different niches to ensure that our stats were not related to only one section of the industry. We then categorized each business included in the study in accordance with their primary niche. E.g. a restaurant with a small grocery store within it is in the restaurant niche, and a bookstore with a coffee shop in the corner is a bookstore. We selected over 20 niches and here are the top 5 that came out of it. In order for us to correlate this study to the real estate industry, we thought it would be relevant to find service-based companies. Therefore, as seen in the full study, 90% of the selected businesses are offering a service, or sell to customers directly. We wanted to confirm the idea that the consumer does not want to be disappointed by the places that they choose to go anymore. Thus, using a more detailed visual will help them confirm their choice. Both use pictures or videos in order to reflect what they can bring to the viewer. Which means, that in many cases, people can be disappointed by the fake rendering, the lack of transparency, or the inaccurate point of view that they’ve been presented. Which usually ends up as lost time for both parties. The first thing we did regarding the data consisted of analyzing the visibility of each business that was selected and create an average of their views with it. Thanks to the Google Street View Partner Program, we managed to get over 6 months of data and build a rather precise accumulation of virtual tour views for each of the selected businesses. The results showed that we managed to generate an average of 9,481 virtual tour views per month, per business. According to Google, 42% of unique visitors who end up on a Virtual Tour Street View will visit the company's website. Now, no need to tell me that you are no regular business. I already know that the real estate industry is far different from a coffee shop or a restaurant. However, this small study should give you a hint on how consumers are starting to act. On average, these businesses get between 16,000 and 25,000 views per month on their Google My Business Page. If they are able to get 9,000 people to visit their virtual tour before pursuing their research, it seems to me that most people care about an authentic feeling of the place they choose to go. Fair reasoning could be that people’s time is precious, and no one should waste it. They want to know before they get there, they don’t want to be disappointed anymore, and they surely want to get a feel of the business before investing their time and money in it. As mentioned above, engagement is one the of the most important aspects of online marketing that you should understand. Why? You might ask. Well, you have to see it as it is you’re not the first real estate agent using technology to increase your sales. Last year, 86% of North American agents agreed that the competition between real estate agents is increasing. 91% of them stated that technology plays a key role in their differentiation plan. This is why any agent that reads this article needs to understand that using 3D virtual tours is a good way to kill 2 birds with one stone. By replacing your 2D pictures, by an actual Matterport tour, you are able to up your game in technology while staying within your budget. You will even be able to differentiate the channel of advertisement that you’ve always been using. Using a 3D virtual tour allows you to publish on many different platforms. Just like regular photography, you are still able to publish your content on your website, Centris, or social media, but you also make your viewer’s life much easier. By using Matterport in your strategy, you can add information within the tour (see the image below), and under that information, you can even put a link that redirects to one of your landing pages. This way, you have more chances of getting a lead and increasing your viewer’s engagement. In a recent study conducted by Matterport, they found that 90% of their users stated that 3D virtual tours helped them build a stronger brand in the marketplace. Thus resulting in higher trust from clients and higher customer satisfaction when presenting the virtual tour to a seller. In fact, 74% of the users stated that presenting the tool to their leads helped them close the lead as a client. In a world where only 16% of agents close over 90% of their seller leads, you need to put all possible luck on your side before doing a pitch. Replacing the way you present the visuals of a house seems rather simple when analyzing the benefits but it makes a large impact. Finally, when presented to a buyer, the 3D tour gets a lot of appreciation. It enhances visualization by allowing complete control to the viewer and by reflecting a place 99% accurately. It inspires and excites. 3D floor plan views offer design components with a sense of scale. It also accelerates the intellectual and emotional aspiration of the viewer, which usually helps drive serious buyers towards potential sales. With a Matterport tour, the buyer can prepare more concretely for any changes or enhancements they may need or want to make to the property. Helping these types of reasoning come up to the surface will often help your future buyer budget and build confidence for a potential buying proposal. When you have limited resources for your marketing budget, it’s really important to prioritize tools, products, or services that can cover more than only one area of your plan. This is why changing from regular photography – Or even worse, iPhone photography – to 3D virtual tours, can help you hit 3 birds with one stone. Let’s be honest here, as a real estate agent, chances are you have little to no time to fool around with your schedule. So here’s how a virtual tour can help your case. The most valuable aspect about Matterport virtual tours is that it gives an authentic view of the house. A rendering far greater and realistic than regular photos, or 2D videos. Using a tool that allows you to reflect an accurate view of your listing can, in fact, help you save a lot of time when it comes to visits and potential buyers. It can also help you save time by avoiding possible disappointment. As well, it can help you clear out visiting time in your agenda by sending the 3D tour to the person interested before the actual visit to test their interest towards the house. A lot of agents also use open houses to show listings to potential buyers. But let's be real, how many of you have been waiting in an empty house for 2 hours when organizing an open house. Having a 3D virtual tour reflects the idea of having a website. Meaning that using Matterport to showcase the property will put the actual house open to everyone interested 24/7, not only during 2 hours on a Sunday. You’ll even be able to add valuable information directly into the tour. E.g. marble counters in the kitchen, a breathtaking view of downtown Montreal, etc. A study conducted by apartment.com revealed that listings with Matterport 3D tours generated 403% more leads then listings with regular pictures. In the same study, they realized that listings with a 3D tour got 40% more clicks, 95% more phone inquiries, and 65% more email inquiries from the website. Finally, an asset that we have found regarding Matterport products is that it helped the agent save even more time by generating a floor plan with dimensions that are 99% accurate. With its laser sensors, the camera can identify the rooms and the measurements of the house within 48 hours after the shoot. This saves on average a good hour of the agent’s time that was used to measure the dimensions of every room. The seller’s benefits are pretty short since it’s a product mainly directed towards real estate agents and buyers. However, there are two crucial things that we can’t ignore. Being different than your competitors as well as saving time for your client. Even if over 250,000 3D virtual tours were created since 2011, don’t forget that the product is still relatively new on the market. Matterport tours can easily bring you that ‘’I’m better than my competitor’’ feeling. As we said earlier, 90% of agents using the product stated having a stronger brand since they started using Matterport, and 74% stated that it helped them close more listings by simply showing what they can offer their clients. It’s simple when using a company like us to create your tour, you can have access to normal HDR pictures, a 3D tour, a short video, a GIF, and a floor plan. All this for roughly the same cost that you pay for regular HDR pictures. That’s a strong argument in your favour when presenting to a lead what you want to do for them. This is without mentioning that all Matterport tours are accessible in VR which brings a relatively strong technology WOW factor to the table. In 2017, 80% of sellers felt that they were spending to much time on preparing the house before a visit. In a case study created in partnership with Remax, agents realized that they could spend less time travelling back and forth to the client’s house, and also drastically increase the percentage of serious buyers asking for a visit. Ending in less time spent by the real estate agent showing the house to different buyers, and less time spent by the client preparing the house before each visit and open house. In that same study, Remax showed how the average time of a listing on the market went from 77 days to 43 days, a difference of 56%. This can easily serve as an argument in your future sales pitch. On the buyer’s point of view, Matterport 3D tours are pretty much the top that you can get at the moment. The accurate representation of the property is definitely a characteristic that positively affects the user’s experience when searching for a new home. We have to get real with how people use the tools they have access to. In the next 2 years, 80% of millennials will seek to purchase a property, and 92% of buyers are looking online before contacting the real estate agent. Which means that online search is not going anywhere. When it comes to understanding how your buyer works, you have to start with the basics. 41% of home buyers find interactive maps useful in the search process, and 40% feel the same about virtual tours. In fact, according to apartment.com, people spend up to 3 times more time on the listing webpage containing 3D virtual tours. Engagement is again the key metric you should understand. The 3 statistics that we just mentioned are relevant when it comes to understanding your audience. Adding simple add-ons like a Matterport Tour to your visual documentation can widely improve your customer’s experience. When seeing the listing for the first time, most potential buyers will start building the idea of what they want it to look like if they move in. This is why using Matterport can be such an asset for the agent. By integrating Mattertags within the tour, you will be able to showcase whatever information that helps you sell the listings, whether it’s photos, videos, text or even links to redirect to your landing page. Your buyer will now have a more serious idea of the offer they want to make and will be more subject to follow through during your pitch. This summarizes Matterport Tour pretty much in its entirety. With the changing behaviour of online consumers and the growing competition and diversity in the real estate industry, opting for small tricks like changing regular photography for 3D tours can add a lot of value to your service. For a really small investment (most of the time cheaper than regular photography), you are able to up your game from 3 different points of view. As an agent, you will drive your listing time on the market down, you’ll save time for the seller, you’ll help the buyer decide properly and more accurately, you will be able to generate more leads and create a WOW factor for your client when presenting the visuals you did for them, you will change the way the seller looks at what the agent can bring, and most importantly, you will make everyone in the scenario a winner. Comments on Why Are 3D Virtual Tours Beneficial To Real Estate Agents, Buyers, And Sellers? Case Study | Is SEO Really Worth it For a Restaurant?